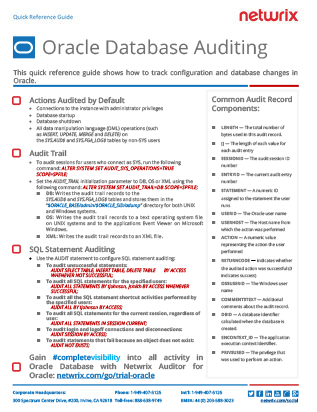 Why Do You Need to Collect and Safely Store your Oracle Database Audit Trail? Many regulatory compliance standards require organizations that handle sensitive data, such as PII or credit card data, to keep Oracle audit records from all their database instances for years. This audit log data can be used to provide evidence that the security of critical information is under control, as well as to address auditors’ questions at compliance checks. Enabling an audit trail in Oracle databases with native tools will help you keep an eye on all SQL statements, including DROP TABLE and CREATE DATABASE; plus, you can track login/logoff connections and disconnections. With fine-grained auditing set up, you can stay on top of the activity in your databases, analyze and trace aberrant user behavior (such as unauthorized data access or unwarranted changes to audit settings, parameters or schemas), and more. On top of using standard auditing of SQL statements to prove at compliance checks that all the security controls are in place and your organization diligently follows compliance requirements by collecting and storing an audit trail in Oracle databases, you can use this system audit intelligence for further reviews and in-house investigations. For example, if you spot suspicious activity, such as a DBA’s unnecessary access to a database object with sensitive data, you can go back into your past audit records and find out how the DBA gained the necessary access privileges and what he or she has been doing with them, so you can prevent future privilege escalation and abuse.